Do you want to remember and share your milestones & memories with loved ones that are away on duty or at home awaiting your return? Air Force Life Deployment Journal will allow you to do just that. Fill in your milestones & memories then share them with your loved ones upon their return. This beautiful journal is formatted to show one day per page, with blank lined pages. Air Force Life Deployment Journal is great for everyone experiencing a deployment. Keep a deployment journal for yourself and have your loved one keep one as well. Once you're reunited exchange your journals and share your experiences with each other. This is the perfect gift for anyone who's loved one has been called to duty. Do you want to remember and share your milestones & memories with loved ones that are away on duty or at home awaiting your return? Army Life Deployment Journal will allow you to do just that. Fill in your milestones & memories then share them with your loved ones upon their return. This beautiful journal is formatted to show one day per page, with blank lined pages. Army Life Deployment Journal is great for everyone experiencing a deployment. Keep a deployment journal for yourself and have your loved one keep one as well. Once you're reunited exchange your journals and share your experiences with each other. This is the perfect gift for anyone who's loved one has been called to duty. Knowing that no one comprehends the challenges that a soldier faces like another soldier, the inspiration for this book comes from the writings of an ancient soldier who righteously protected the innocent; stood firm on the ferocious frontlines of battle; patrolled dangerous checkpoints; walked the lonely late night and early morning watches; guarded city gates; climbed rugged terrain in all kinds of weather; and faced enemies in the deserts and on the mountains. That soldier, King David, endured many of the same experiences as today's soldier. He also needed and drew strength daily from Almighty God. He wrote of his struggles and victories, recorded his prayers and praises from his experiences. What encouragement, hope, and comfort come from the Psalms he left to us. This devotional countdown calendar-journal is meant to be a source of daily encouragement, a place where soldiers and their families can record feelings and events that have impacted them during their deployment experience. It is a legacy of shared courage and sacrifice of and for the outstanding men and women who serve our great nation in military service. Sharon Patterson, retired educator, career military wife, and leader in women's ministry, has written inspirational encouragement in various forms, from greeting cards to short stories, poetry, and Bible studies for over twenty-five years. Sharon and her husband, retired Colonel Garry Patterson, are the parents of three grown sons. Two sons presently serve in the U.S. Army. Sharon and Garry reside in Round Rock, Texas. Coming Home is a journal and devotional designed to offer inspirational messages for armed service personnel and their families. Each page format contains a Scriptural quotation, devotion, and space for journaling thoughts and prayers. The quotes and devotions offer thoughts to carry you through the day. The journal will also include original letters from previous wars, cadences used by the military and a section to journal your thoughts and best wishes for your family and friends as you wait to be reunited. 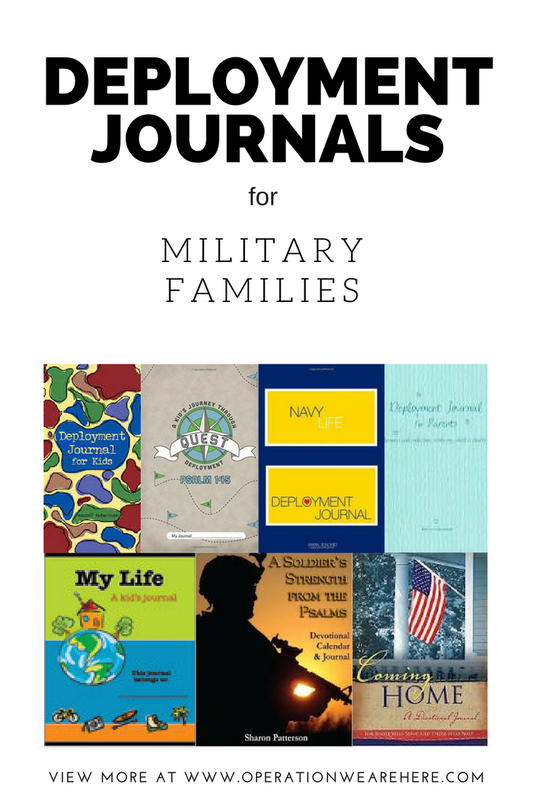 A Military Family Member Deployment Journal designed by military spouses and military members. Deployment Journal for Kids is a special journal created for children to record feelings and events during a loved one's military deployment. A variety of proven journaling techniques provide a framework for children to better understand deployments, express and communicate their feelings, and tell their own story. Contains calendar pages, writing prompts, interesting facts about common deployment locations, military definitions, helpful ideas, and a pocket to keep mementos. 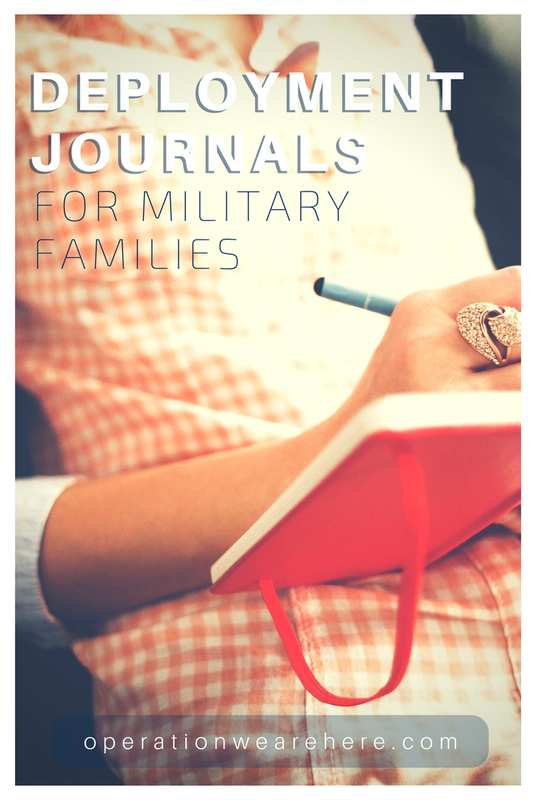 A personal journal for parents who have an adult child deployed with the military. Gentle journal writing prompts and inspirational sayings guide you through deployment and homecoming. Keeping Track section in the back helps you log milestones, communication, and special moments. Textured teal Pellaq cover with yellow ribbon. A personal journal for anyone who has a significant other deployed with the military. Guided journal writing prompts, inspirational sayings. This special edition journal is a tribute to all of our service men and women. Whether you are in the service or have a spouse, family member, or friend who is in the service... this journal is a must have! Write down daily events, concerns, future plans, and life’s milestones to share with your loved one(s). This journal makes a great keepsake or documentary of this demanding yet rewarding time of your life. 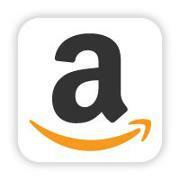 Get free shipping on any products listed on their website. Do you want to remember and share your milestones & memories with loved ones that are away on duty or at home awaiting your return? Marine Life Deployment Journal will allow you to do just that. Fill in your milestones & memories then share them with your loved ones upon their return. Marine Life Deployment Journal is great for everyone experiencing a deployment. Keep a deployment journal for yourself and have your loved one keep one as well. Once you're reunited exchange your journals and share your experiences with each other. This is the perfect gift for anyone who's loved one has been called to duty. Do you want to remember and share your milestones & memories with loved ones that are away on duty or at home awaiting your return? Navy Life Deployment Journal will allow you to do just that. Fill in your milestones & memories then share them with your loved ones upon their return. This beautiful journal is formatted to show one day per page, with blank lined pages. Navy Life Deployment Journal is great for everyone experiencing a deployment. Keep a deployment journal for yourself and have your loved one keep one as well. Once you're reunited exchange your journals and share your experiences with each other. This is the perfect gift for anyone who's loved one has been called to duty. Quest is a 30-day devotional booklet aimed at 6-to-10-year-old children with a military parent who is deployed. The devotions help children focus their prayers and work through some of the not-so-easy times during their parent’s absence. Most importantly, Quest helps children to know they are not alone. The Lord is beside them on their journey. This booklet of prayers also provides space to journal along with an alphabetized word from Psalm 145 (Awesome, Bless, Commend, etc.). The journal concludes with a four-day set of devotions which explains the gospel. While You Were Away: Absence Journal for Children is a resource designed to assist children in dealing with the extended absence of one or both of their parents, as occurs during a military deployment. It provides exercises and tips for identifying, understanding and managing the many emotions that occur during this period. It also provides practical tips for dealing with difficulties of separation. While You Were Away: Absence Journal for Families is a resource designed to assist families in dealing with the extended absence of one or both, as occurs during a military deployment. It provides exercises and tips for identifying, understanding and managing the many emotions that occur during this period. It also provides practical tips for dealing with difficulties of separation. While You Were Away: Absence Journal for Teens is a resource designed to assist teens in dealing with the extended absence of one or both of their parents, as occurs during a military deployment. It provides exercises and tips for identifying, understanding and managing the many emotions that occur during this period. It also provides practical tips for dealing with difficulties of separation.